The parents of this 7-week old red wolf pup keep an eye on their offspring at the Museum of Life and Science in Durham, North Carolina, June 13, 2017. A pack of wild canines found frolicking near the beaches of the Texas Gulf Coast have led to the discovery that red wolves, or at least an animal closely aligned with them, are enduring in secluded parts of the Southeast nearly 40 years after the animal was thought to have become extinct in the wild. 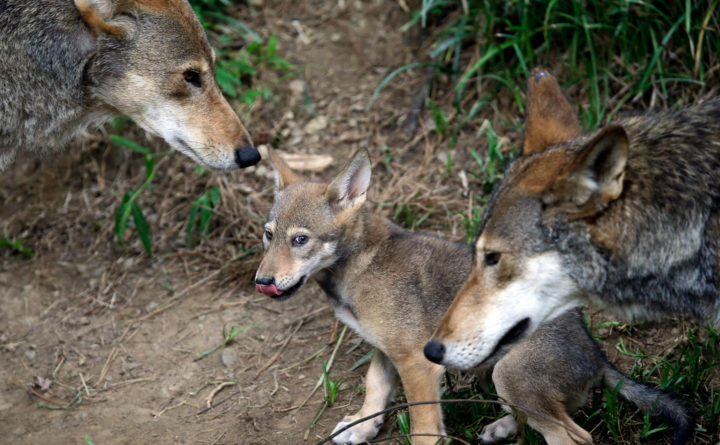 The red wolf, which tops out at about 80 pounds, was once common across a vast region extending from Texas to the south, into the Southeast and up into the Northeast. It was federally classified as endangered in 1967 and declared extinct in the wild in 1980. The U.S. Fish and Wildlife Service in the 1970s captured a remnant population in Texas and Louisiana that eventually led to a successful captive breeding program. Those canines in 1986 became part of the experimental wild population in North Carolina. That group has been declining since peaking at an estimated 120 to 130 wolves in 2006. A federal report in April said only about 40 remained. Associated Press reporter Jonathan Drew contributed to this report.